Tullamore Golf Club made home advantage count when they overturned a 3-2 deficit from the away leg against Baltinglass to claim victory the Barton Cup Final. Tullamore won the second leg by 4-1 on Sunday to claim the title by 6-4 overall. Matthew Grehan & Pat Corcoran beat Jason Bowes & Kevin Lord 5/4. Eoin Flanagan & Roddy Molloy beat Eric Doran & John Kavanagh 4/3. Barry Gillespie & Ciaran Boland beat Fergal Doogue & Michael O'Neill 2up. Ray Coughlan & Eoin O'Ceilleachair lost to Derek Byrne & Tommy Keogh 3/2. Paul Galvin & Declan Farrell beat Nathan Geraghty & Johnny Keogh 3/2. 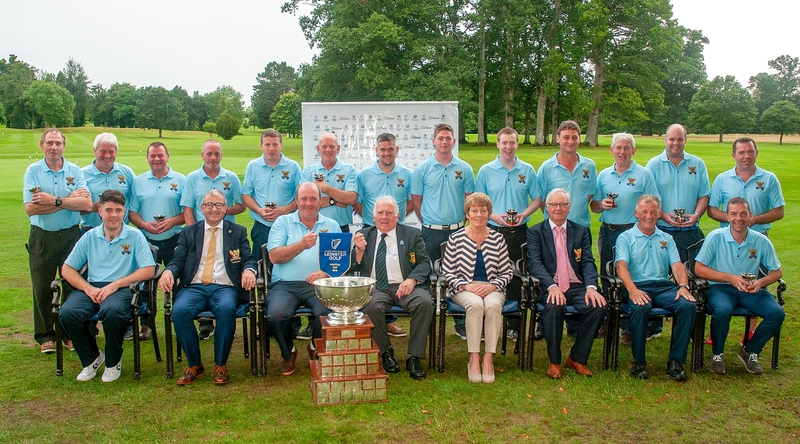 The winning Tullamore team, front (l to r): Sean Lynch, Brian Gunning, Captain of Tullamore, John Lynch, team manager, John Ferriter, Chairman of Leinster Golf, Kathleen Leonard, FBD Sales Executive, Tullamore, Joe Feely, President of Tullamore, Liam Hoctor and Declan Farrell. Back: Pat Corcoran, Martin Darcy, Noel Mannion, Paul Galvin, Eoin Ó Ceilleachair, Ray Coughlan, Barry Gillespie, Matthew Grehan, Ciaran Boland, Eoin O’Flanagan, Roddy Molloy, David Loughlin and Colm Cassidy.